Hailed as a “force of nature” (Variety), Dolora Zajick has been internationally acclaimed as that rare voice type, a true dramatic Verdi mezzo-soprano, typified by the composer’s most famous and difficult mezzo-soprano roles. 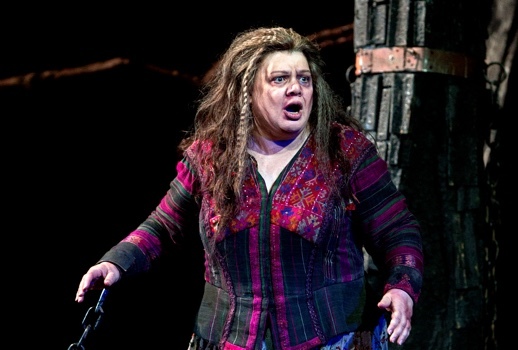 With her expressive vocal palette, seamless technique and ability to communicate even the most complex character, Dolora is particularly renowned for her interpretations of Azucena in Il trovatore, Amneris in Aida and Eboli in Don Carlo on the world’s greatest stages. She has appeared in opera and concert with some of the foremost conductors of today, which include James Levine, Anthony Pappano, the late Bruno Bartoletti, James Conlon, Daniele Gatti, Valery Gergiev, Lorin Maazel, Charles Mackerras, Zubin Mehta, Riccardo Muti, Michael Tilson Thomas, and the late Mstislav Rostropovich. Highlights of Zajick's 2017-2018 season include performances as Ulrica in Verdi Un ballo in maschera at the Liceu in Barcelona, as Mamma Rosa in Cilea l’Arlesiana at the Deutsche Oper Berlin and her role debut as Gertrude in Hansel and Gretel at the Metropolitan Opera. Other highlights include performances as Ortrud in a new production of Lohengrin at Madrid’s Teatro Real, a role in which she made her debut at the Los Angeles Opera in 2010, as Zia Principessa in Puccini Suor Angelica in Barcelona, as Ježibaba in Dvorák Rusalka, as the Countess in Tchaikovsky The Queen of Spades at the Metropolitan Opera where, in a single season, she also took on Verdi’s three premier mezzo roles: Azucena in Il Trovatore, Ulrica in Un Ballo in Maschera and Amneris in Aida. Houston welcomed her as Amneris in Aida and as Azucena in Il Trovatore and Washington National Opera as Adalgisa in Bellini Norma. In addition to her outstanding performance career, Zajick is a passionate vocal pedagogue, having founded the Institute for Young Dramatic Voices in 2006, a vocal training program for large or unusual voices designed to help nurture their development according to their unique needs, and to help these young singers reach the world stage. The institute is an intensive 3-week summer program of study with leading coaches and voice teachers who understand the nature of large or unusual voices. Dolora Zajick was one of the first recipients of the Opera News Award held in 2005 along with James Conlon, Régine Crespin, Susan Graham, and Plácido Domingo, and in October 2009 was honored by the Giulio Gari Foundation in recognition of her extraordinary operatic career. In 2011 she received the Ortrud Award from the Committee for the Marjorie Lawrence Awards for Opera Excellence and OMTI.